Intentionally timed to coincide with the world’s biggest show for watches and jewelry, Baselworld 2018, premier watchmaker for the smart generation MyKronoz, has launched a digital campaign that goes beyond category clichés, and pokes fun at old-school watches and their wearers. Playfully contrasting the legacy-focused world in which owners of classic timepieces live with that of today’s connected generation, MyKronoz subtly introduces viewers to its groundbreaking hybrid smartwatch ZeTime – an affordable timepiece for traditional watch lovers who also want a smart device. 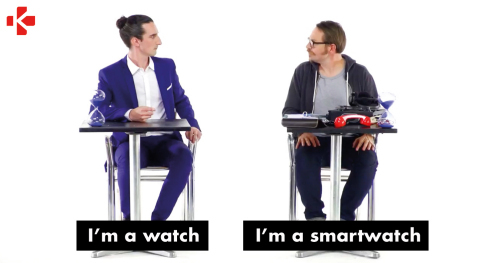 Debuting on social platforms, six spots in the ‘I’m a watch, I’m a smartwatch’ campaign portray two rival, quirky characters who respectively personify the watch and the smartwatch, and hint at the superiority of a hybrid device like ZeTime, which combines the best of two worlds. In one spot we see classic watch man sitting meekly with an hourglass on his all but empty desk. By contrast, smartwatch man next to him is busy mixing the decks, taking phone calls, checking the weather and reviewing a map. "What (kind of work) do you do?" he asks, looking over at his unremarkable neighbour. "Well, I tell the time…." . "Nice!" replies smartwatch man, charitably. In its first five days the spots have been viewed over 2 million times on Facebook and Instagram. MyKronoz recently broke crowdfunding records, raising over $8,000,000 for ZeTime in a year. This makes ZeTime the most crowd-funded hardware product of 2017, the highest funded hybrid smartwatch ever and MyKronoz the most funded European company in Kickstarter history. ZeTime belongs to the fast-growing segment of hybrid smartwatches – a subcategory that will make up over 50% of the smartwatches market by 2022. Nearly 80 million hybrid smartwatches will be shipped by 2022, up 460% from an estimated 14 million in 2017 according to IDC. (These figures contrast with shipments of traditional Swiss watches, which decreased by 4.3% in 2017). About ZeTime: The world's first hybrid smartwatch with mechanical hands over a color touchscreen, ZeTime offers the classic design of a Swiss timepiece with most advanced features of a smartwatch. MyKronoz’s proprietary ‘Smart Movement’ technology enables ZeTime’s always-on hands to function for up to 30 days with a single charge, ensuring the primary function of the watch – to tell time – is always running. With a retail price starting at $199, the hybrid device is available in two different case sizes (39mm and 44mm) and displays (1.05 inch and 1.22-inch). ZeTime boasts three collections comprising a variety of watch case finishing and bands, to appeal to a wide audience. About MyKronoz: Founded in January 2013, MyKronoz is a Swiss company headquartered in Geneva that designs and develops wearable devices to expand and facilitate the connected experience of the smart generation. Bringing together the essence of watchmaking tradition with innovative technology, MyKronoz offers a full range of affordable and stylish wearables, starting at a price point of $39 only, spanning across 4 product categories: activity trackers, smartwatches, hybrid smartwatches and watch phones, all compatible with iOS and Android. Present in more than 40 countries, carried by major retailers and partners worldwide (Orange, Auchan, Carrefour, Amazon, Best Buy...), MyKronoz has sold more than 3 million products and established itself as a fierce challenger to both tech and traditional watchmakers. MyKronoz is part of BOW Group, a global player in the Internet of Things (IoT), operating worldwide in the wearables, connected vehicles and smart home markets. In July 2015, BOW raised €10 million from NextStage AM in series A funding round and closed in November 2017 its $23.5 million series B funding lead by PM Equity Partner, the corporate venture fund of Philip Morris International. Creative credits: The « I’m a watch; I’m a smartwatch » campaign was co-created with YZ, a creative digital marketing agency based in Paris, Berlin and soon London. YZ is a protean, internationally focused team that mixes creativity, a design-thinking approach to idea generation and brand reputation management expertise.